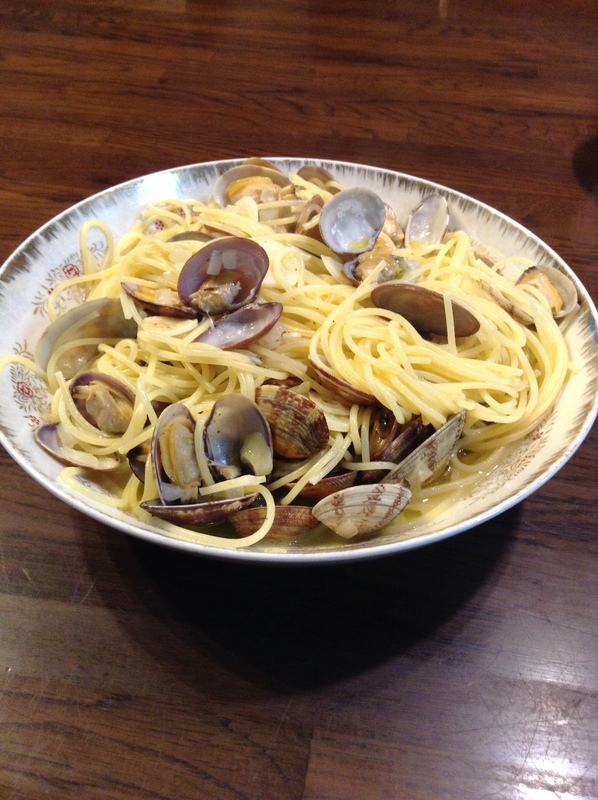 Asari, Japanese littleneck clams, are in the market now and may be some of the easiest shellfish to cook with at home. We picked these up at Tsukiji Market and put them in water to get rid of any sand and grit. It’s best to do this overnight if you can. We wash the clams in water and then put them in a bowl of water and cover with aluminum foil. When we put the clams in the bowl they were all closed shut. Check out how much they opened up overnight. Be sure to make time to rid the clams of sand or don’t bother making them. It can be very frustrating to bite into a sandy clam. 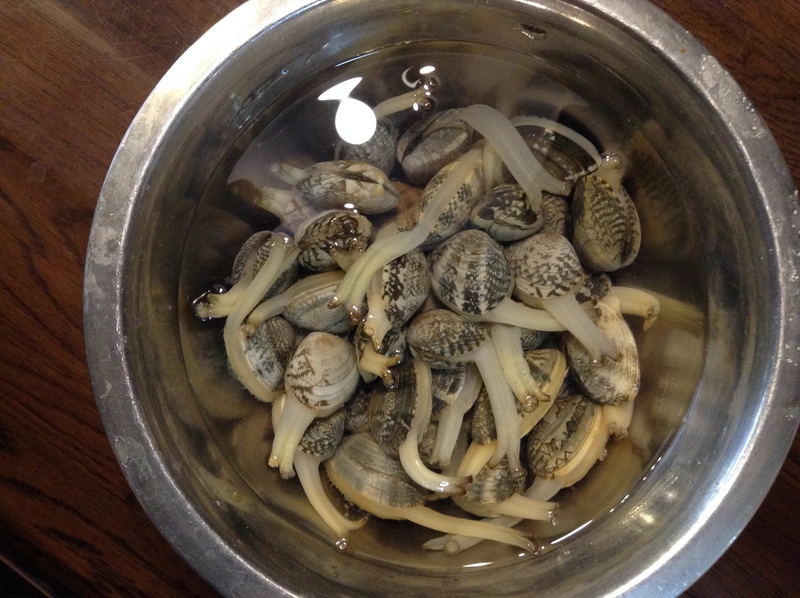 Perhaps the easiest recipe is to simply steam the clams in saké with a bit of salt. That of course is best served with some of the saké that it is steamed in. Our next favorite is to sauté some garlic in olive oil, add white wine and the clams and let them open up and then add some pasta for a quick vongole. Our three-year old loves this and requests it often. 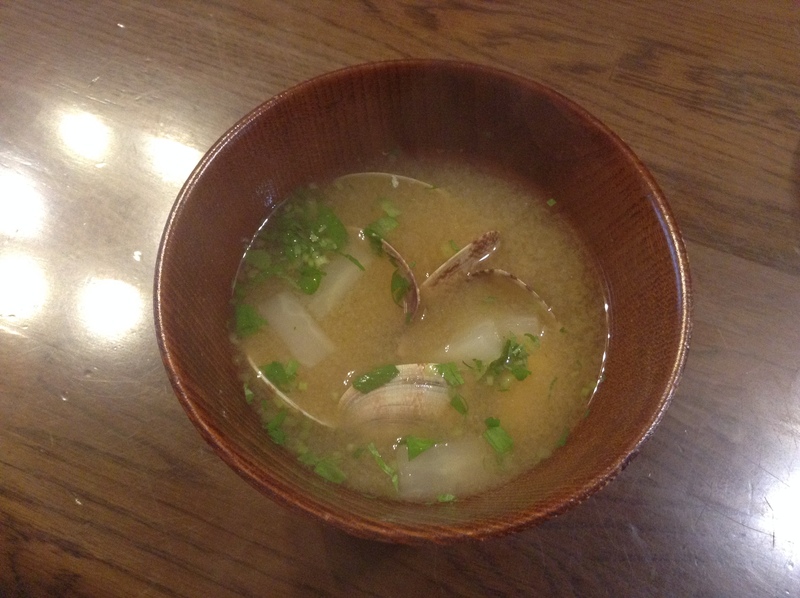 Finally, boiling the clams in water and adding miso makes for a quick and easy miso soup. This bowl here we had cooked some daikon in the water before adding the asari and then garnished with finely minced daikon greens. Look for asari at the supermarket in the seafood section. It is usually sold packed on styrofoam trays and wrapped in plastic wrap. I usually pay only about 250 to 400 JPY for a pack that feeds three of us. Asari should be eaten as soon as possible. They will not keep long so only buy when you are ready to eat, usually later that day or for the next day.